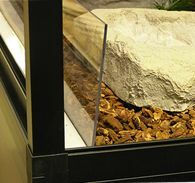 We chose the name Hybrid® because it is a perfect description of our reptile enclosure system. Instead of conforming to one particular type of enclosure, we pick the best materials for each function. 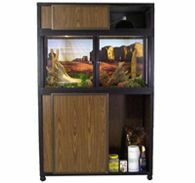 For example, the doors and side panels on our standard reptile tanks and reptile enclosures are clear acrylic so you can view your pet, the back is laminate or a custom background to give the enclosure a professional, classy appearance, and the bottom and top also come standard in our laminate material. The end result is not one particular type of reptile enclosure, but a “Hybrid®” of all different types of enclosures to give you the best of all worlds. 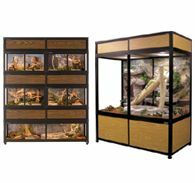 In addition, every species of reptile is different and every situation is unique, which is why we also allow customers to customize their reptile enclosures and choose what types of materials they would like to use depending on their circumstances, thus creating their own unique Hybrid® custom reptile cages. Give your pet room to stretch! 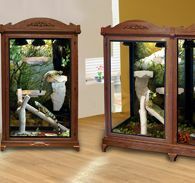 These enormous custom Hybrid reptile cages and reptile tanks are our most popular Hybrid reptile cage specials! Plenty of room for multiple herps in many of our enclosures. 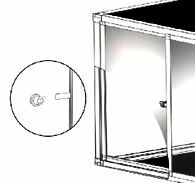 Optional Pull Out Dividers separate a cage to house multiple species, or add a hood for lighting or a stand for storage of all your herping supplies. 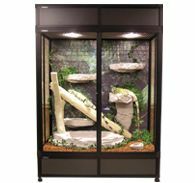 The Hybrid large reptile cages & enclosures below come in Black Granite, Natural Granite, Cambridge Cherry, English Oak, Golden Oak and Prestige Maple. Find out more about our reptile tank material options. 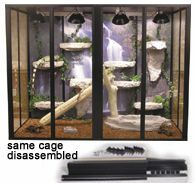 Configure Your Own Hybrid Reptile Cage! 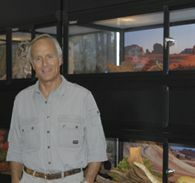 Trusted by Jack Hanna, used on Extreme Home Makeover, Pimp My Ride, by Humane Societies nationwide and the Make-a-Wish foundation on multiple occasions, CagesByDesign is trusted by and has sold more build-to-order reptile, bird and small animal cages sold than anyone, anywhere! 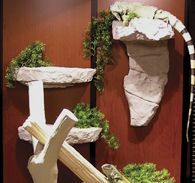 As a family owned and operated business, we put a lot of personal dedication and pride into our reptile enclosures and accessories and are proud that our customers world wide can have the ability to create the ultimate habitat for their pets. All of our aluminum and stainless steel materials are made in the USA as well as our reptile cages, with materials bought from many suppliers close to our facility in northern Wisconsin. 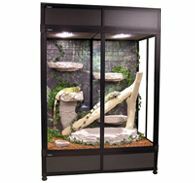 Pick your own reptile cage size, panel material, the perfect size hood or stand, and add or remove dividers, debris and aggregate stoppers, Replica Furniture and countless other options as you choose! We make every reptile cage specifically to order for each customer one at a time. During business hours we're available on the phone to walk you through your custom cage building experience. You can even choose one cage size now, and purchase extra panels to make your cage bigger later down the road as your needs change. Changing your reptile? You can change your panel type later too, making our Hybrid reptile cages very budget friendly. All Hybrid reptile cages come standard with acrylic fronts and sides, and laminate top, backs and bottoms. But any panel can be made out of any material that we offer. To learn more about our materials, please visit our material info page. Over the past ten years we have worked tirelessly to design, modify, and re-design our reptile cage system. We have used over a dozen engineers, tested countless prototypes and materials, used computer generated strength analysis, and spent thousands of hours on our design to ensure it has the proper strength, durability, and functionality. We have proprietary patents, we invented our reptile cage design, we own the tooling, and nobody else can copy our reptile enclosures. Any front door, back, side top or bottom can be made out of acrylic, glass, stainless steel wire, thermofused laminate, aluminum laminate, or perforated aluminum. 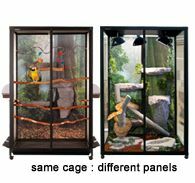 These panels are all interchangeable and can be switched or replaced at any time without having to purchase a new reptile cage! We design our reptile enclosures with acrylic fronts and sides, and laminate top, back and floor panels with your choice of 6 colors. This is intended for air flow, and also allows for a great viewing space in the front, and maintain a classy look in the back. 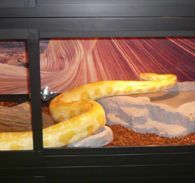 We have learned though our own experience, as well as through our customers, how difficult it can be to get other reptile enclosures as large as ours into your home and put together. This is why all of our Hybrid reptile cages break down for easy transportation and mobility. When you are moving there's no need to buy a new enclosure, our enclosures can be taken down and reassembled many times. We have even sold very large cages similar to the ones pictured to the right to a traveling circus that takes down and puts back together the cages three times a week! This is a feature very few other reptile enclosures offer and can save you the cost of purchasing an entirely new cage down the road. Because of the way our system is designed, in a rare circumstance if a panel were to be damaged it could easily be replaced without having to replace the entire cage. One of the most frustrating aspects of purchasing a reptile enclosure is trying to decide how large to get it. As a result, herp owners may end up buying several enclosures throughout the life of the animal, each time throwing one to the curb. With our Hybrid reptile enclosures, you can purchase the size that's appropriate now and add on later! Our reptile cage system is completely stackable without having to purchase expensive racking equipment. 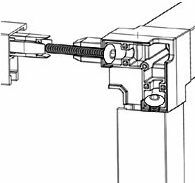 Our corner joint system has pin slots molded into them to easily stack and lock multiple enclosures together. This also allows hoods and stands to be interchangeable with the entire reptile cage system. 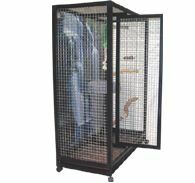 The same pin slot can also be used to install casters so your reptile cage can be moved easily! All of our enclosures require assembly once you get the reptile cage. The cage comes with an allen wrench to secure the frame members of the cage together. The only other tool required is a #1 phillips head screw driver. 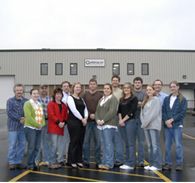 For some larger units we recommend two or more people for assembly to help manage the large frame or panel members. A moderate skill level is required for assembly. We also have live support available during business hours to help you through any problems you may have. Our cages consist of very thick aluminum that is hardened and anodized to resist denting and scratching. H2 Hybrids are designed with medium to small herps in mind, and H3 Hybrids have much thicker and more heavy-duty materials, designed for stronger, larger reptiles. Our anodized aluminm frames are strong, lightweight and corrosion proof. 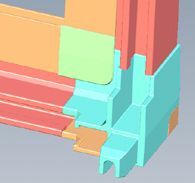 Our revolutionary corner joint and wedge system allows for quick assembly and easy stackability. Also makes additions of casters a breeze! The corner system is our own invention for this specific application. These parts are also designed to withstand an extraordinary amount of force without breaking and are designed for easy, secure assembly and dissassembly. Proprietary door locks pin doors together to make escape virtually impossible. Keeps animals in and people out! Security was a top priority when designing our cage system. Our frame design and locking system address this issue thoroughly. First, the outer handles of the cage interlock securely with the outside frame of the cage making it nearly impossible for anything to escape. We also invented a revolutionary locking system for the middle of the doors that pin them together. This feature makes it nearly impossible to slide them open, or for an animal to slither out when properly locked. The lock is keyed and is placed outside the acrylic doors, meaning your herp does not have access to the locking mechanism. This also comes in handy for public applications like pet stores, zoos, or museums where keeping people out is as important as keeping animals in. Adding a hood to any of our reptile cages is an excellent way to add vibrant light to your cage without having to look at unsightly fixtures. Hoods, like the one shown above, give a finished look to your Hybrid reptile cage, making it a centerpiece in your home. Stands are a great place to keep herpsupplies such as food and substrate and also elevate the cages to eye level. 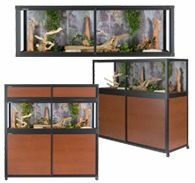 Our removable dividers can be added to any Hybrid reptile enclosure. The dividers easily remove from the front of the cage and you can use as many as you wish to divide your enclosure. 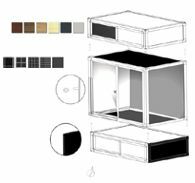 The divider allows you to partition your cage for multiple species, without having to purchase several cages. This is very useful for breeders who may want to allow pets to have contact only during certian times of the year, or for people with reptiles that do not get along. These images are even more stunning in person than in our pictures. Images are printed, laminated to the back of your reptile cage, and covered with a durable, protective clear material for moisture, scratch and UV resistance (prevents fading). Images are extremely high resolution and will be cropped to fit the back of your cage perfectly. 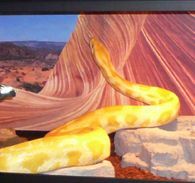 Over 40 backgrounds to choose from, or have your own custom image printed for your Hybrid reptile enclosure. Our 4" tall clear plastic strip is custom cut for the length of your cage and bent to not infterere with our reptile cages' sliding doors. Keeps aggregate in the cage and out of the door track. Debris and aggregate stoppers have a 1" adhesive strip to attach them to the cage. You just bought a big cage with lots of space, why not use it? Our new line of ReplicaTM furniture is molded from natural objexts with high density expanded polyurethane making them look very realistic, resistant to harboring bacteria and insects, and easy to disinfect. We also designed these products to be strong enough to hold extremely large animals, yet mcuh lighter than natural objects. They make the perfect solution for most habitats. 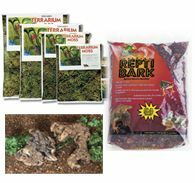 Create watering holes and improve the overall decor of your pet enclosure with some of our great reptile cage accessories: Manzanita Roots, Large Cypress Knees, Cedar Roots, Repti-Bark, Terrarium Moss, Repti-Sand.